With strawberry season just around the corner, the sweetest and most delectable berries of the season will be begging to be made into a strawberry torte. Like most torte recipes, this recipe for strawberry torte looks complicated, but once you break it down into the individual parts you will see that it really is just a matter of putting a few simple parts together. I have found that it is best to start with the cake part. 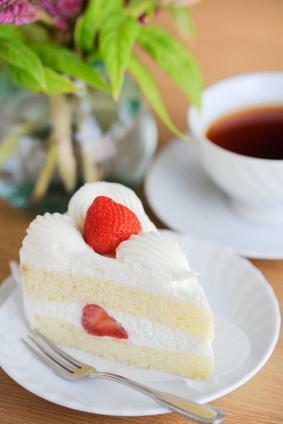 This strawberry torte recipe calls for a genoise cake, but if you happen to have a favorite cake recipe that you prefer to use, go ahead and use that cake instead. I have made this recipe with both chocolate and white cake, although the white genoise cake is the standard. But chocolate and strawberries match so well that if you want to use a chocolate cake, I say "go for it." Spray a 9-inch cake pan with non-stick spray. Line the bottom of the pan with a round of parchment paper. Spray the parchment paper with non-stick spray. Using a small saucepan, melt butter over a low flame. Transfer the butter to a small bowl. Place the eggs, sugar, vanilla, and salt into the bowl of your stand mixer and beat using the whisk attachment until it has tripled in volume. Remove the bowl from the mixer and fold the flour into the egg mixture, one-third at a time. Be very gentle while folding the flour into the eggs. If you are too vigorous, you will deflate the eggs. Pour some of the batter into the bowl of melted butter. Fold until the butter and the batter are combined. Fold the batter/butter mixture into the original batter. Using an off-set spatula, smooth the batter out so that it is evenly distributed in the pan. Bake for 20 minutes and then test for doneness. Remove the cake from the oven and let cool for ten minutes on a rack. Turn the cake out onto the rack and let cool completely. Once the cake is completely cooled, wrap it with plastic wrap and let it rest overnight. I find that the cake is easiest to work with when it has rested overnight in the refrigerator. The cream needs to be used the day it is made, otherwise it will set and be difficult to work with. Once the cake is chilling, you can start on the cream part. Sprinkle the gelatin over the cold water in a small bowl. In a medium bowl, whip the egg yolks and sugar until light and thick. In a medium saucepan, scald the milk. Very slowly stream the hot milk into the egg/sugar mixture while whisking the entire time. Place the bowl with the egg/milk mixture over a pot of simmering water and stir constantly until the mixture thickens. Stir the gelatin into the mixture. Mix until the gelatin is completely dissolved and the mixture is smooth. Cool the mixture in your refrigerator, stirring occasionally to keep the custard smooth. Whip the cream until it forms soft peaks. Don't over whip the cream. Once the custard is very thick but not fully set, fold the whipped cream into the custard. Pour into the cake pan over the strawberries. The cake needs to be soaked with Kirsh flavored syrup. Place the water and sugar in a saucepan. Place the saucepan over a medium flame. Let the mixture boil for about five minutes. Once the syrup is cool, mix in the Kirsh. Let cool completely and then pour into a squeeze bottle. Once you have all the parts together, you are ready to make a strawberry torte. Using a large serrated knife, cut the cake in half lengthwise so you have two layers of cake. Using a 9-inch spring-form pan, spray the inside of the pan with non-stick spray and then wrap a strip of acetate around the inside. Place one layer of the genoise in the bottom of the pan. Soak the layer with the Kirsh syrup. Trim the tops off of the strawberries. Cut half of the strawberries in half lengthwise. Place these strawberries around the outer rim of the cake so that they are pressed against the acetate. Cut the remaining berries into quarters and scatter them over the cake layer. Pour the Barvarian cream over the strawberries until it is ½ inch from the top of the cake pan. Place the second cake layer on the cream. Soak this layer with Kirsh syrup. Spread a thin layer of cream over the cake. Let chill in the refrigerator for at least one hour. Remove the cake from the pan. Just before serving, remove the acetate strip and drizzle strawberry syrup over the top of the cake.